Please check again with the exact code in our documentation and restart your reportserver after putting the files in onstartup.d and onlogin.d respectively. Please test with a dynamic list and let me know. ReportServer upgrades the database automatically if needed, so you don't need to do anything here. In this case, though, the database is the same as with 3.0.6-6006. What does it mean "" in last line - it looks strange? I cannot find what every argument means for calling addReportExportOutputFormat. strange. Are you using the exact code in the documentation including this last line ("") and everything else? Can you post some screenshots showing your exact configuration, your scripts and the output? Did you check the logs for any error ? 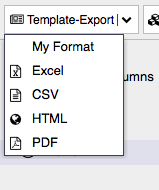 1: new TableReportDtoDec(), 2: "My Format", 3: "MY_CUSTOM_FORMAT", 4: ""